For this Thursday’s post about something that inspires me, I’ll share what my friend Heidi and then my friend Claire shared with me (great minds think alike! 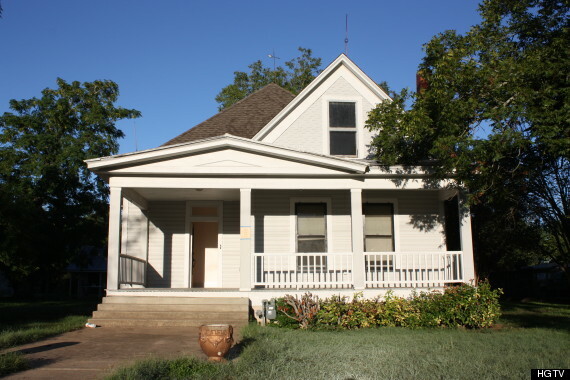 ): the story of a family featured in the Huffington Post who renovated their historic farmhouse in only 6 months! Check out the article via the above link. Anything particularly interesting that you’ve uncovered during the renovation? Our favorite finds were the original ceilings under the popcorn — beautiful, gorgeous long leaf pine planks. We almost died of joy. They are stunning. I stare at them every single day. We also found many dead rodents, but those were less fun. What were the biggest challenges you faced in completing the overhaul? Our kitchen got so cold this past winter that the fridge sweated. Think about it: the inside of the fridge was warmer than the outside. We had baseboard heating in the family room that worked, thank goodness, and in our master bedroom too. When guests came over (no joke), instead of offering to take their coat, we would offer them a scarf or extra coat to put on. It didn’t help that this winter was one for the record books in both duration and temperatures. And, like Mrs. Hatmaker, I think we have to be somewhat psycho too to live in a house while you are renovating it completely! I think that’s an amazing bathroom. 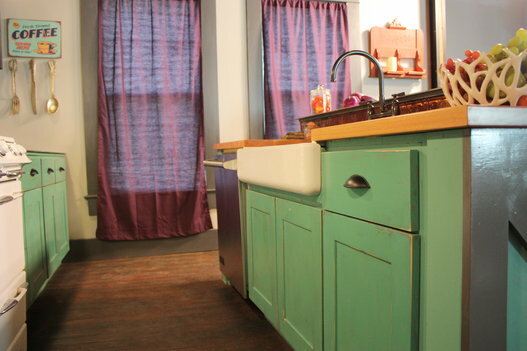 LOVE the raw plumbing and the vessel sink on top of the distressed furniture. So cool! 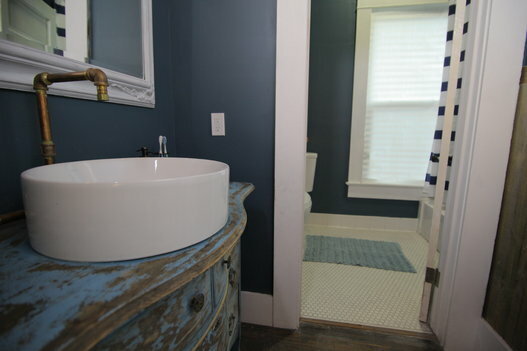 The paint color they chose is awesome too– looks beautiful against the white trim/ accents. Anyway, they have a show on HGTV that premieres tonight at 11 pm! We don’t have cable, but you should check it out!